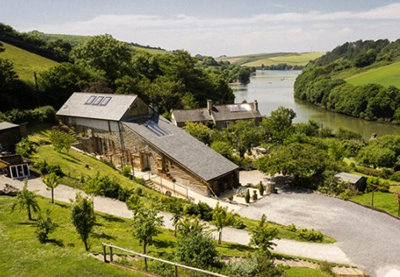 This wonderful period farmhouse occupies a scenic waterside position at the head of Waterhead Creek, which leads down to Salcombe and its estuary. The house, buildings and garden occupy a gently sloping gradient that runs down to the creek in front of the house and all enjoy great views to the north and west over the water. Accommodation in total comprises: hall, 40 ft sitting room, superb open plan reception/dining area with vaulted kitchen study, games room and conservatory, plus six bedrooms (four en-suite), and four cloak/bathrooms. The gardens and grounds come to around an acre. The property lies beside the quiet tidal lane between the popular villages of East Portlemouth and South Pool with an historic church and a well known 16th Century pub with excellent food. East Portlemouth is at the mouth of the Salcombe Estuary and is linked via the passenger ferry to the bustling town opposite, which is the hub of the water based recreation for which the area is renowned and offers the amenities of a sophisticated maritime resort. The market town of Kingsbridge is about 6 miles and has two supermarkets and good specialist shops. The guide price is £1.6m. For further information please contact Savills on 01392 455 700 or visit www.savills.co.uk.